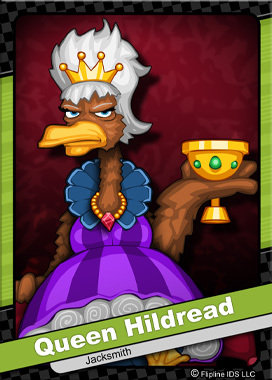 Hildread is the often cranky Queen of Plumpfeather Kingdom. She comes from the Royal Gizzardo family who presided over the old Kingdom of Evershade. Her arranged marriage with King Plumpfeather successfully merged the two under the single Plumpfeather reign. Queen Hildread is known to make the lives of her staff and underlings very unpleasant with her short temper and persnickety palate.